Ludo Ducrocq is a worryingly busy man. As global brand ambassador for William Grant and Sons‘s range of blended whiskies he seems to spend a lot of time on the road – last week London, this week Monaco, next week China, the week after somewhere else that only his Blackberry knows. After having a chat with Becky, the ninja behind the @grantswhisky Twitter account, we started trying to sort out a time when I might meet up with Ludo – he ends up eating out a lot while travelling and tries to find people to help him punish his expense account rather than sitting in a restaurant on his own. After a number of false starts we managed to book a night a mere two months in advance – last Tuesday. After a couple of changes in plans we ended up arranging to meet in Albannach by Leicester Square, along with Jason and Darren of Whisky Squad fame. Ludo wasn’t always a whisky guy, arriving in Scotland from France to study contemporary Scottish literature. In 2000 he started working as a tour guide at Glenfiddich to earn a bit of cash, only to find that he got sucked in and ended up doing a bit of ambassadorial work. He’s now moved on from Glenfiddich and has taken up the reins as the first Grant’s global ambassador and blogger. It’s a bit of a weird position as in the UK Grant’s is usually seen on the supermarket shelves as a low-cost blend, but in other parts of the world it’s a bit more of a luxury item, hence the constant travel, with their higher end whiskies very rarely seen in the UK. Luckily Ludo had brought along a couple of bottles to let us see what we’re missing. Grant’s started out with William Grant, he of the company’s name, who was born in Dufftown in the heart of Speyside in 1839. After a number of jobs, including shepherd and shoemaker, he ended up working at Mortlach, where over the space of 20 years he advanced to be distillery manager. He then went for the natural next step – starting out on his own. In 1886 he started building the Glenfiddich distillery, starting production a year later in 1887. In 1892 he further expanded by buying the Balvenie distillery, about half a mile down the road. Around this time the world of blended whisky was starting to boom, with Andrew Usher’s work in the 1860s inspiring a variety of companies to start up as blenders. Seeing that this was the way of the future Grant decided to make his own blend, combining some of the whiskies from Glenfiddich and Balvenie and launching it in 1898 under his own name. In the early years of the 20th century they started to make moves overseas with John Grant, William’s son, travelling to the US and Canada and starting to sell whisky there. They further expanded with Charles Gordon, William’s son-in-law, making a year long sales trip eastwards from 1909-10, setting up commercial links with the far east and Australia, making them one of the most widely distributed Scotch whiskies of the day. This meant that while other distilleries got hit hard by the World Wars and US prohibition they had further territories to fall back on, weathering the first half of the 1900s quite well. While the 5th generation of Grants since the company’s founding are now in charge, the 4th made a lot of the changes that have shaped their whiskies today. In the 1950s they commissioned Hans Schleger, who also did a lot of work for London Transport on posters and logo design, to create a new bottle for them. He came up with their now fairly iconic triangular profiled bottle, used for both Grant’s and Glenfiddich, which sat with the square Johnnie Walker bottle as a big change from the more traditional round shape used by most other distillers. In the 1960s they decided to move more of their production inhouse, building the Girvan grain distillery on the Ayrshire coast in 1963. Since then they’ve continued the expansion, with the 5th generation building the Kininvie distillery in the grounds of Balvenie and more recently Ailsa Bay next to Girvan (close to the former site of the Ladyburn distillery, built in 1966 to supply malts for the Grant’s blends but soon mothballed and dismantled in 1975), increasing their production now that Glenfiddich is the best selling single malt in the world. While they may have Glenfiddich and Balvenie in their stable we were there to talk to Ludo about (and have a taste of) the Grant’s blends. We started off with the Grant’s Ale Cask, released in 2001. They’d been experimenting with cask finishing their blended whiskies, with the finishing of single malt being a fad at the time, and decided to try something a bit different, using casks from the Caledonian brewery. However they couldn’t get enough of them so commissioned their own beer from the brewery, to be filled into their own casks to season them ready for finishing their Family Reserve blend. The beer that went into the casks has gone on to be quite famous in its own right as Innis & Gunn (which I’ve written about before), but the first run of the blend didn’t work – the Family Reserve has a little bit of peaty whisky in the mix, which really didn’t work with the ale casks. So David Stewart (Grant’s 5th master blender, since retired after 47 years in the job and replaced by Brian Kinsman) had a tweak of the blend and produced one without the peat influence, which they then finished for a month in the ale casks. The whisky is quite young, 5-7 years in general with an intention of producing a whisky which tastes as if it has been aged for that length of time, and contains a high proportion of grain, as grain whisky picks up mature flavours from the casks faster than the slower maturing malts (as well as being a bit cheaper). I’ve had a bottle of this whisky in my cupboard, picked up as my ‘experimentation whisky’ due to it being fairly cheap (I used it for my butter washed whisky last year), and I’ve not had a taste since I started banishing my unjustified (and wrongheaded) dislike of blends. On the nose it was malty, with honey, a touch of young spirit, stacked cut grass and an underlying prickly meatiness. As it sat in the glass the heavy meaty/malty scents faded to reveal a lightly floral top note. To taste it was quite big and spicy, with caramel, digestive biscuits and milk chocolate, sitting around for a little bit with finish of chocolate almonds. I tried the bottle I have in my cupboard and it wasn’t quite the same – thinner and not as rich. This either means they’ve been tweaking the recipe over the last couple of years, my bottle had got a bit oxidised or the atmosphere at dinner helped me enjoy it a lot more than I’d expected. Whichever it was I was happily surprised by the Ale Cask, and found it to be quite drinkable. 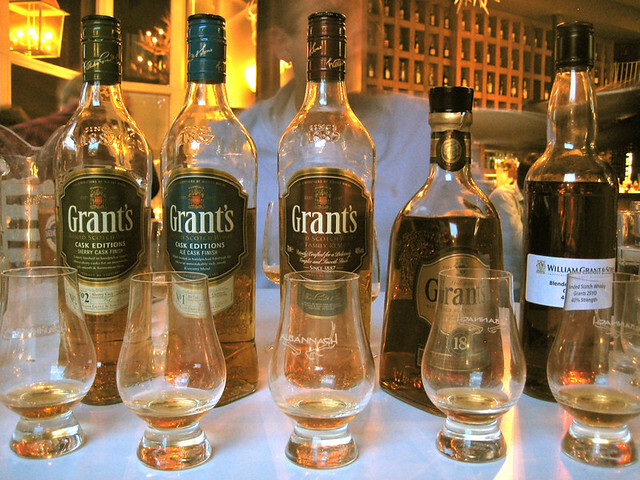 Next was the flagship Grant’s blend – The Family Reserve. This is the whisky they sell most of and it’s the one that you see in supermarkets and on backbars all over the UK. It’s made up from about 30 different single malts and 2-3 single grains, and there are about 3 vattings of it per month to keep up with demand – in total about 1000 casks of whisky per month. The nose had chocolate limes, a hint of earthy smoke and the same dry meatiness that the Ale Cask had. To taste it had vanilla and cinnamon up front, with more of that young spirit flavour and a touch of chocolate. The flavours hung around for a little bit, with the finish developing from spicy to a low cocoa solid dark chocolate. This was very much a bog standard blend to me – a hint of smoke and a bit of Speyside richness balanced by younger spirit and some light grain. While I generally like young whisky and grains the mix isn’t really to my taste, making me want either the younger whisky or the more older whiskies used to add complexity to the blend. The third whisky was the last of the ones generally available in the UK that we had to try (as Albannach had run out of the 12 year old blend leaving us with only three of the four), the Sherry Cask. This appeared in 2001 and was the first blended whisky to be ‘finished’. 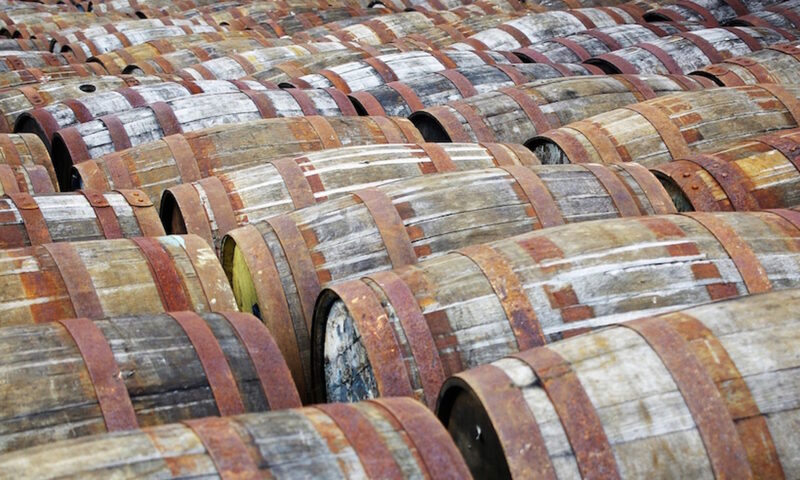 While individual components may have been finished or matured in sherry casks before noone had actually finished a completed blend before, with Grant’s leaving it to sit in the sherry casks for 3 months. The first impression from the nose was rum and raisin ice cream – creamy with a bit of astringent booziness. This was followed up with walnut bread, fruit cake and BBQ sauce. Taste-wise it had lime cream, stewed raisins, malt loaf and a big vanilla note. The finish didn’t hang around for long but was full of marzipan. A definite improvement on The Family Reserve for me, with the sherry casks smoothing out some of the younger flavours and creating a more rounded whisky. Next up we tried the 18 Year Old, available only in markets outside of the UK or at the distillery, with our bottle being one that had originally been destined for South America (complete with ‘anti refill’ pourer in the neck – I hadn’t realised that the pourers often found jammed in the necks of bottles that I’ve bought when on holiday were to stop counterfeiters/dishonest bar owners from refilling bottles with substandard booze). This one is finished in port pipes and has won gold medals at the IWSC for the past 5 years. It was certainly a cut above the last three whiskies, with a nose of vanilla custard, eccles cakes and malt. To taste it was spicy, with vanilla, strawberry milkshake and a bit of prickly wood smoke. The finish lingers, with nuts and cream becoming slowly fruity and then leathery. The final bottle on the table was the 25 year old, in a simply labelled bottle to save space in Ludo’s bag – he correctly guessed that we were more interested in the liquid in the bottle than the bottle itself. This whisky was launched in 2009 to mark the 100th anniversary of Charles Gordon’s trip to the east and includes casks from the first batch distilled at Girvan in 1963 as well as some Ladyburn and whisky from other closed distilleries. On the nose it had a big meaty sherried note, with vanilla, creme brulee, strawberry ice cream, plasticine, candle wax and PVA glue. To taste it had rich fruit cake with marzipan, cinnamon butter, cherries and sweet cream all leading to long finish of buttered raisins and dry wood. This was rather good, with discernible elements of good old grain and older whisky combining together well. Combined with its pretty box and difficult to find nature I’d say it’s worth the £150 that it’ll costs (if you can find it – it’s a travel retail exclusive, restricted to ‘the finest’ airports in the world…). A strangely mixed bag – the Family Reserve is a fairly standard blend, with the Ale and Sherry Casks adding an interesting tweak, but the 18 and 25 are both in a totally different league, pricewise as well as flavourwise. It’s quite easy to see why they don’t market both sets in the UK, but at the same time disappointing. Hopefully as consumer knowledge improves we’ll see some more of the interesting whiskies here at home. Blended Scotch Whisky, 40%. ~£15-20. Blended Scotch Whisky, 40%. ~£50 (I think). Available outside the UK or at the distillery. Blended Scotch Whisky, 40%. ~£150 from travel retail until the end of 2011. Many thanks to Ludo for putting up with our questions and attempts to sidetrack him at every turn, and to Becky for organising everything and sending me over samples of the 18 and 25 year old. Becky deserves special mention for not only organising Ludo’s scarily busy schedule but also for helping to make sure we found each other on the day despite being ill and not being able to come out to dinner herself. Ta muchly.